Join Kaleidoscope (the University of Bath Staff and PGR LGBT+ group) for a doctoral students tour of Bath’s drinking history with The Bath Pub Tour. 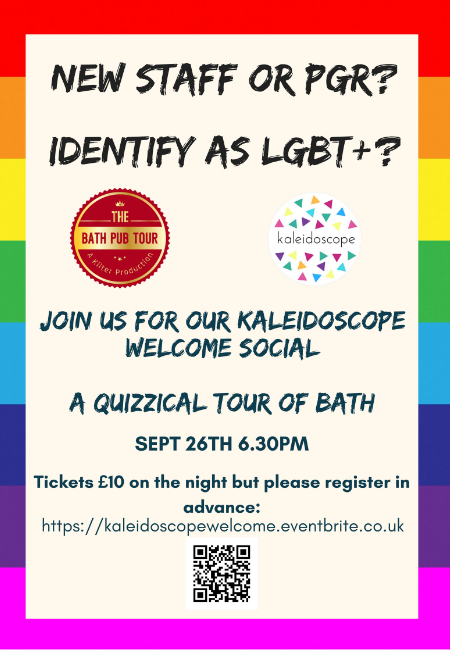 Join Kaleidoscope for an introduction to the LGBT+ community and a tour of Bath's pubs. To welcome any LGBT+ doctoral students who are joining us at the start of this academic year Kaleidoscope (the University of Bath Staff and PGR LGBT+ group) has organised a welcome social on 26 September. We are going on a quizzical tour of Bath’s drinking history with The Bath Pub Tour. Fear not, though, this is not your typical fresher’s pub crawl. Registration is required (with payment on the night in cash). We will meet at 6.30pm at The Crystal Palace Pub and the tour will take place from 7pm to 9pm.